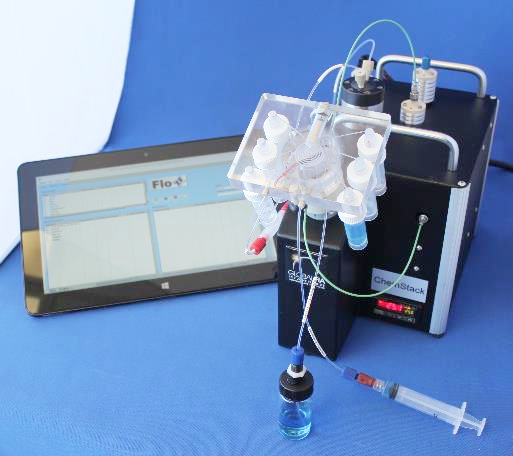 FloPro flow-based analyzer with fully integrated monolithic fluidics manifold. Global FIA is developing the expertise to capture complex flow manifolds in a transparent monolithic block. Channels as small as 0.7 mm (.030”) ID are comfortably accommodated and because these channels are printed rather than machined, new possibilities with regard to channel and manifold geometry are possible. In the FloPro-ChemStack, we mounted our ChemStack manifold on a Valco multi position valve. We equipped the ChemStack with a heated holding coil, pressure transducer and pressure relief valve. Ports are provided to accommodate an external unit operation such as an enrichment column, digester or solid phase reactor. The spectrophotometric absorbance flow cell has a 20 mm path length. The sample port allows priming of the sample without drawing sample into the holding coil. Provision is made for up to six reagents, standards, blanks or wash solution. The 5mL reagent vials are directly coupled to the ChemStack. Off Stack reagent reservoirs are also possible. The following diagram describes the ChemStack flow manifold.